The holidays are just around the corner, so be sure to have an appetizer that will WOW your guests! 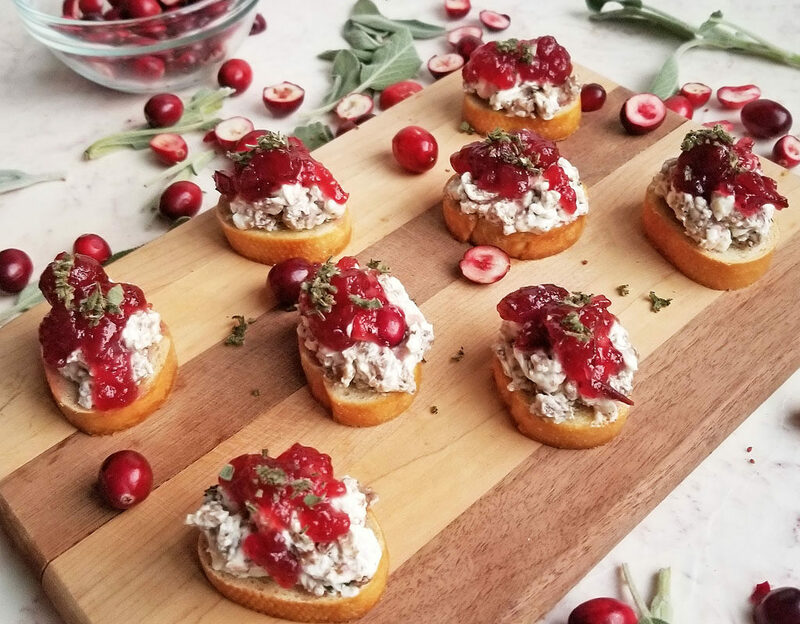 This Cranberry Sausage and Cream Cheese Crostini recipe will do just that! They are made with low fat ingredients, so your guests won’t feel guilty about eating more than 1 , 2…or 10! Lol! I don’t know about you, but I’m getting super excited about Thanksgiving! Thanksgiving means a lot to me because it brings my family together. We cook, laugh, and of course eat! Everyone has their special dish that they enjoy cooking. My husband is always in charge of the turkey and ham, my mom likes to make deviled eggs and collard greens, my oldest sister likes to make the casseroles, my other sister enjoys “tasting” and giving her input (lol! ), my mother-in-law likes to make the sweet potatoes, my dad likes to make pound cakes, the list could go on and on….but my absolute favorite thing to make is the appetizers! While the food is cooking, everyone is usually so hungry as they wait in anticipation for the food to be done! I enjoy preparing a light, but satisfying, appetizer to help take away those hunger pangs! ? For this appetizer, I wanted to create something sweet and savory! 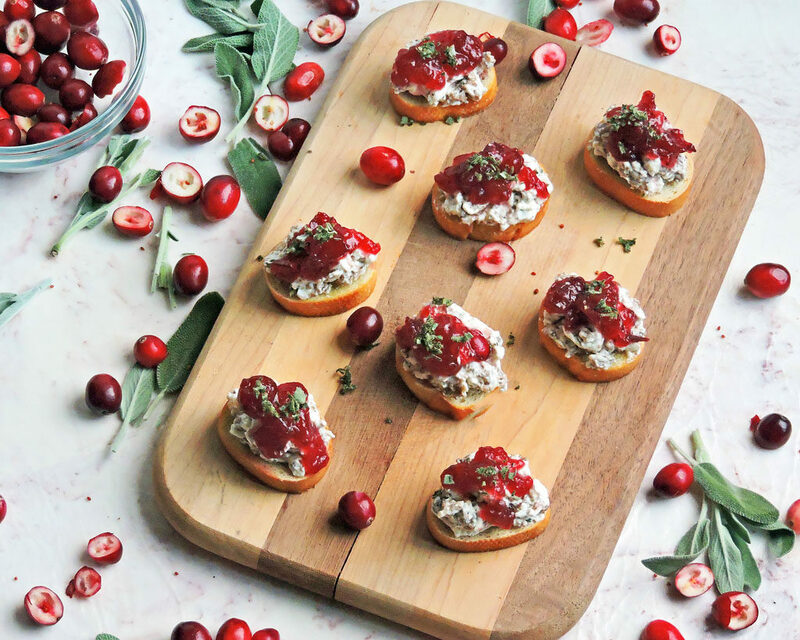 I’m a huge fan of cranberry sauce and wanted to incorporate that into my appetizer! I enjoy making homemade cranberry sauce for Thanksgiving, but for some reason I still enjoy the jellied, canned cranberry sauce! I know, strange right?! But for this recipe, I made a super easy cranberry sauce. When making my cranberry sauce, I always like to cut my cranberries in half. This allows for it to mingle with the sauce a little better. 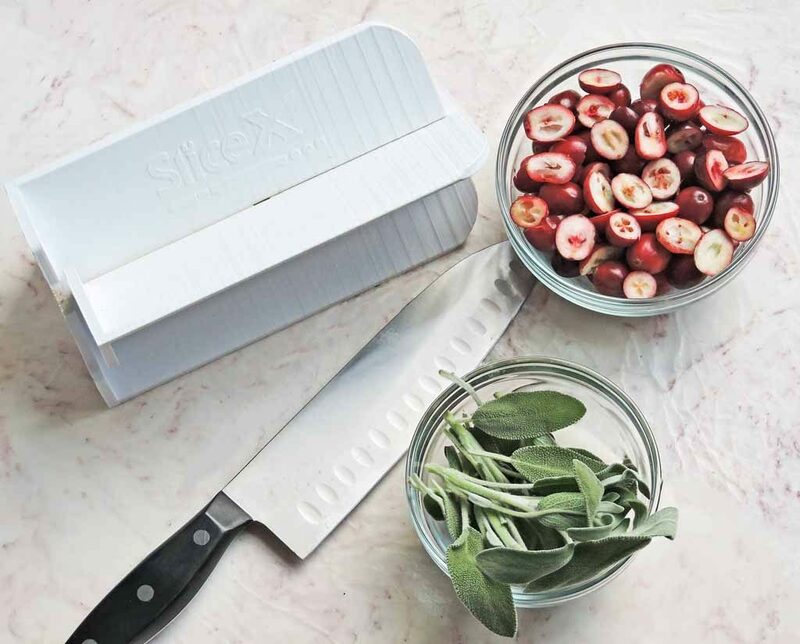 Cutting small pieces of fruit has always been such a tedious task, but thanks to Slice-X, I was able to slice SEVERAL cranberries in half at one time!! Like this is seriously the best invention EVER! It cuts grapes, cherry tomatoes, olives…it’s truly a lifesaver! Not to mention it’s ability to help save my fingers while cutting these small items! (I’m not the best fruit/veggie cutter lol!). Be sure to check out their site, www.slice-x.co, for upcoming launch campaigns and updates!! 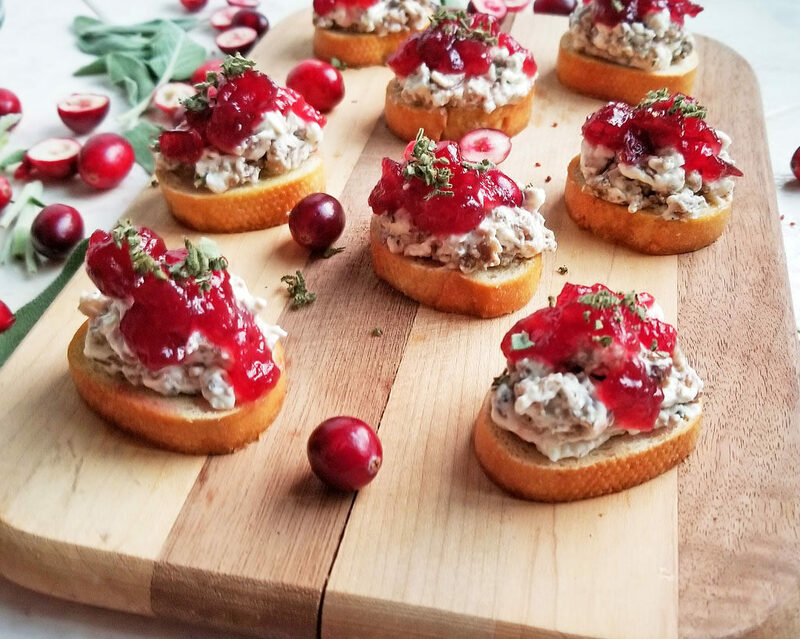 When putting the Cranberry Sausage and Cream Cheese Crostini together, I added some additional fresh sage on top which gave it so much flavor! All of those delicious flavor combinations packed onto one tiny crostini was beyond perfect! Be sure to prepare this yummy dish for your guests on Thanksgiving! Their hungry tummys will thank you! ? In a small sauce pan, on high heat, bring water and sugar to boil. Stir to dissolve the sugar. Add in cranberries, and return to boil. Lower the heat and simmer for about 10 minutes. Remove from heat and let cool completely at room temperature. The sauce will thicken as it cools. Set aside. In a large skillet, on medium heat, add turkey sausage and sage. Cook until sausage is browned and thoroughly cooked. Be sure to break up sausage when cooking. Season with salt and pepper to taste. Drain any excess grease and set aside. In a medium bowl, combine cream cheese and sausage. 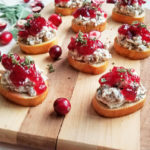 Top each crostini with sausage mixture and cranberry sauce. If desired, top with additional minced sage.